Botanical leaf in watercolour : ivy. Painting leaves can be a hurdle, not least because they can seem like a fairly dull subject to paint compared with the centre of focus in a wildlife painting – the beautiful wild animal or bird! Leaves may be added simply to finish a wildlife watercolour painting but without the same enthusiasm in the rest of the wildlife composition, the leaves may turn out to be a disappointment to the overall painting and even let the whole work of art down to render it a wasted effort. Botanical watercolours for realistic wildlife paintings. A botanical watercolour artist seeks to capture the tiny details that give leaves their individuality but if that isn’t your cup of tea, there are other ways to make sure the leaves are painted to as good a standard as possible. For a wildlife artist, knowing that the leaves form part of the natural world of shelter and food for the wildlife that lives in it can entirely change the approach to painting leaves; they are integral to the wildlife and its habitats in a painting. The natural world is created from leaves and flowers, trees and plants; to make a wildlife watercolour painting (or any other medium) realistic, it is often the leaves, plants and flowers that add the finishing touch to a painting which makes it believable. Although it is fun, modern and often easier to paint a study of an animal or bird on its own in a composition, it helps a subject come alive when its habitat is realistically portrayed. This watercolour leaf was painted in a traditional botanical watercolour style (building up layers of dry watercolour applications) to capture as much detail as possible; whether all that detail is ultimately included in a wider wildlife composition is for later decisions – but the practice of painting the leaf in such detail builds knowledge about its form to later be put to use in a realistic or looser contemporary painting - by choice, rather than opting to undertake a looser painting because painting leaves are considered too tricky to paint. 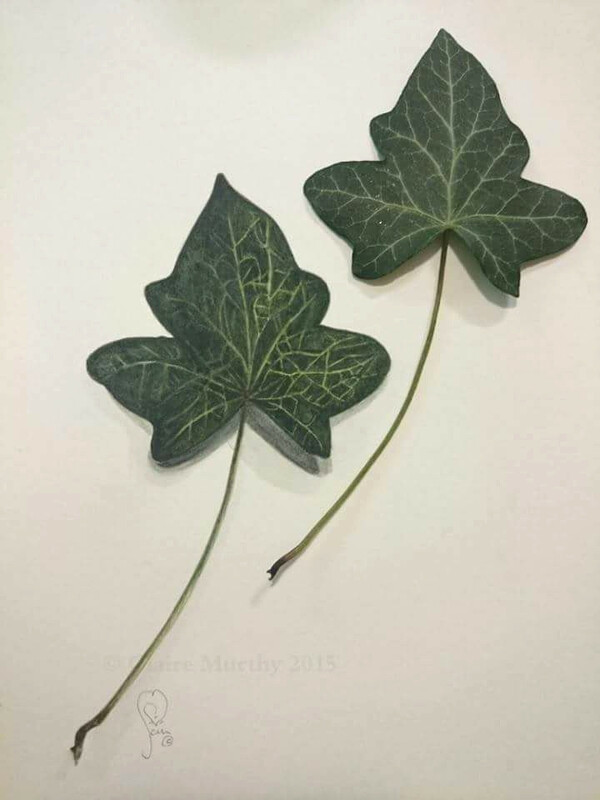 Botanical watercolour ivy leaf - one is painted and the other is real. Almost anyone can paint leaves – you just need to believe in them to bring wildlife watercolours alive. And believe in yourself.